Image caption The man had pulled over to check the roofbox of his car. A determined man got back into his car and drove to work despite having just had his leg broken in a hit-and-run. 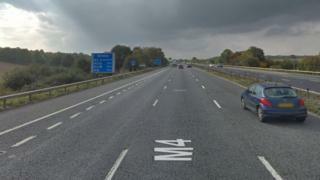 The victim, in his 30s, pulled over on the westbound carriageway of the M4 in Wiltshire on Saturday to check the roofbox of his car. While out of his vehicle he was hit by a passing car, which failed to stop. He suffered a broken ankle, leg and elbow and a 12-inch cut to his arm, but got back behind the wheel to resume the drive to his job in Cardiff. When he arrived his colleagues then called an ambulance. His injuries were described as not life-threatening. "The injured man was driving a silver Kia Ceed, and he was hit some time between 05:30 and 06:00 on Saturday morning."